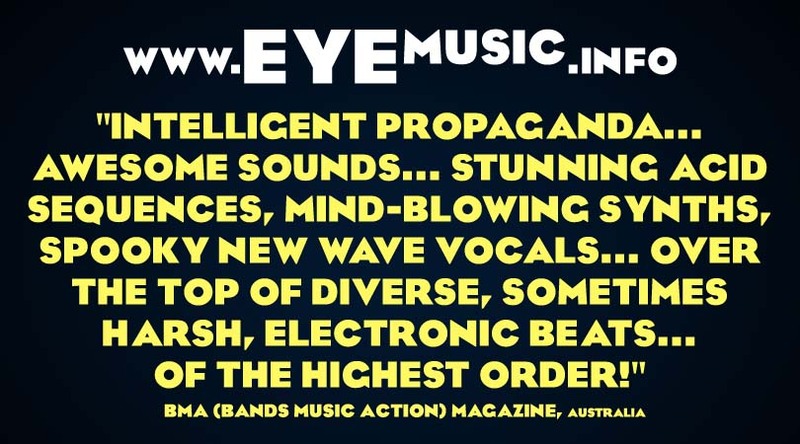 EYE is an underground independent music/musical band/group/artist that explores a range of dark alternative (mostly heavy electronic-based) music genres - see below for further description. 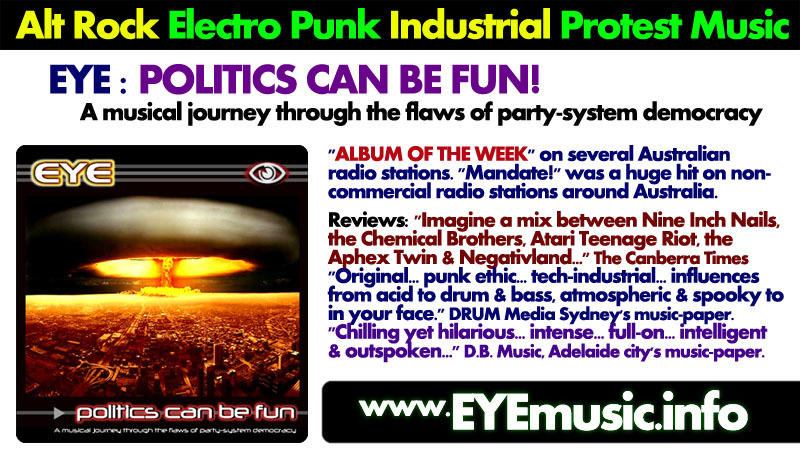 A dozen EPs and albums have been recorded and released via mail-order networks, independent record stores and websites. 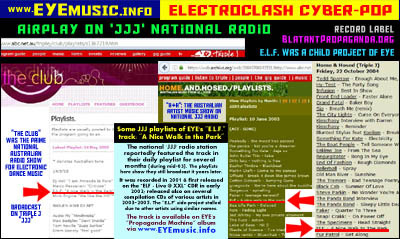 Currently only 3 of the albums are available: on BandCamp via www.EYE.audio. 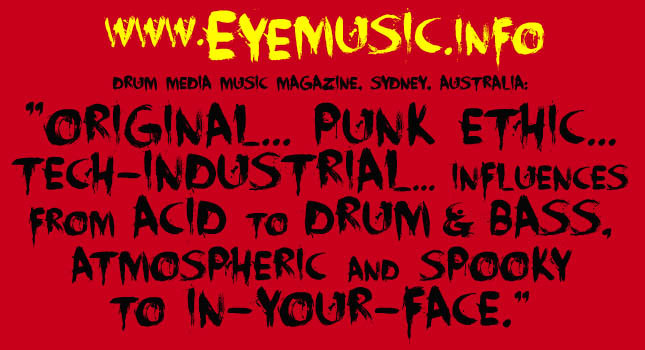 EYE plan to remaster and re-release several albums and EPs during 2019. 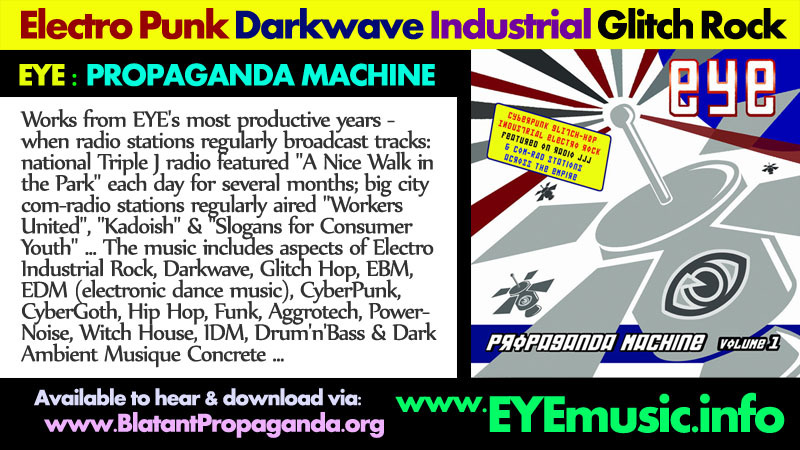 Click the links below to hear currently available albums. 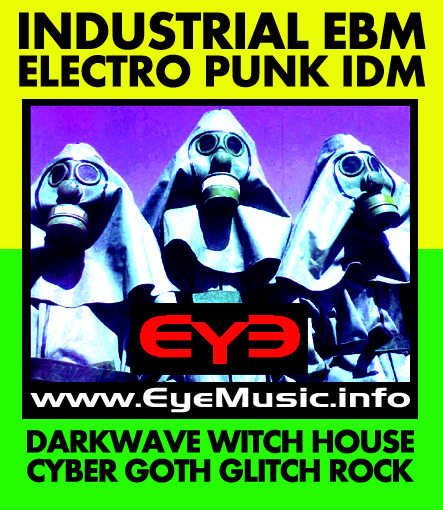 This page lists around 60 instances of EYE music being released on Various Artist compilation albums. 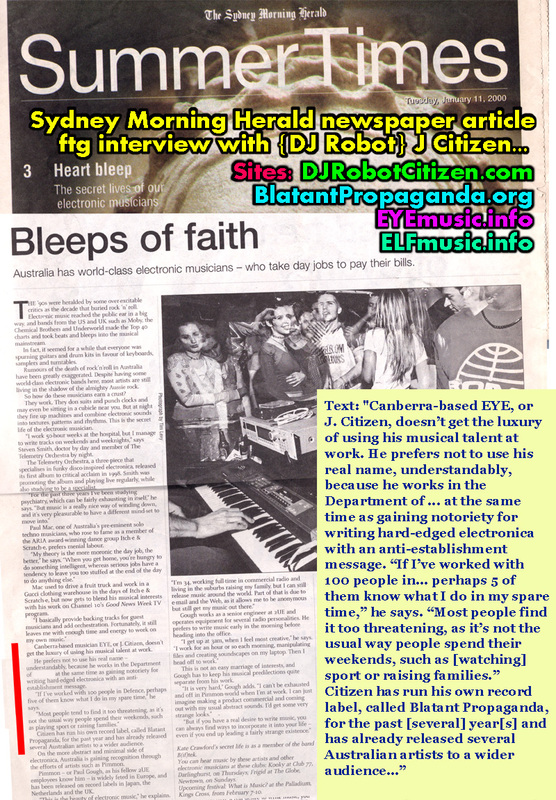 Numerous music media and newspapers have interrogated EYE's humanoids - mostly as "J Citizen". 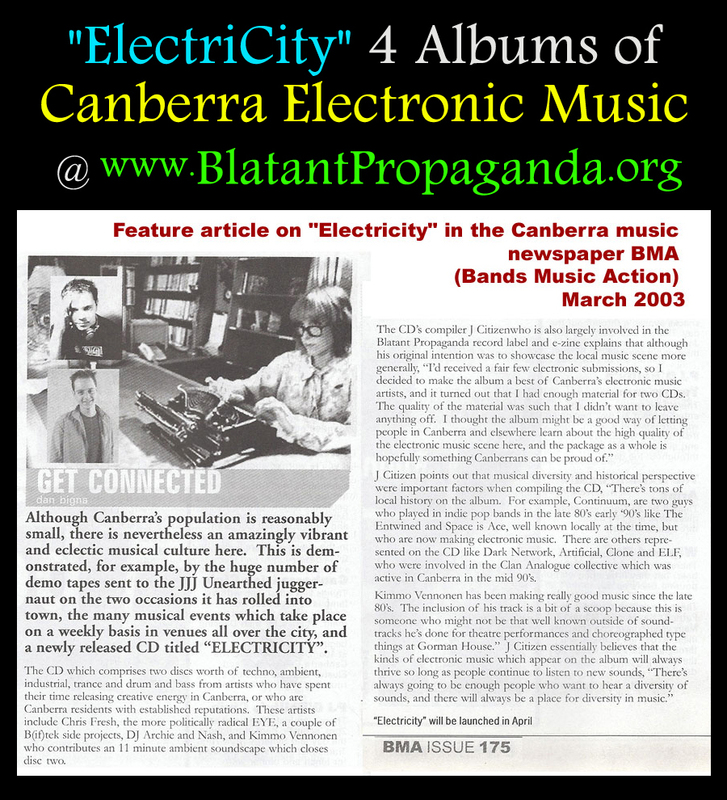 These media include: Sydney city's music papers "DRUM Media" and "3D World" ... the "Sydney Morning Herald" newspaper ... "The Canberra Times" newspaper as well as the "BMA" (Bands Music Action) music magazine ... among feature articles like this one in "Cyclic Defrost" music magazine (then available in record stores) ... the national "Green Left Weekly" political newspaper ... ... "Chain DLK" a European magazine for the industrial music scene subculture amongst reviews in many other publications. (The links above open a new window with images of these articles). 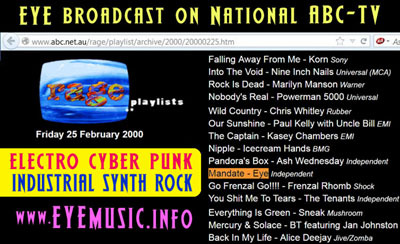 Numerous radio stations have interviewed EYE including: 2SER, 2RRR & Bondi-FM (Sydney); 3RRR, 3CR & 3PBS (Melbourne); 5DDD (Adelaide); 4ZZZ (Brisbane); 2XX (Canberra); 6RTR (Perth); 6CCR (Fremantle); 2NUR-FM (Newcastle); VOX-FM (Wollongong); and national programs "Beatroot" (Community Radio Satellite) and "Alchemy" (SBS). 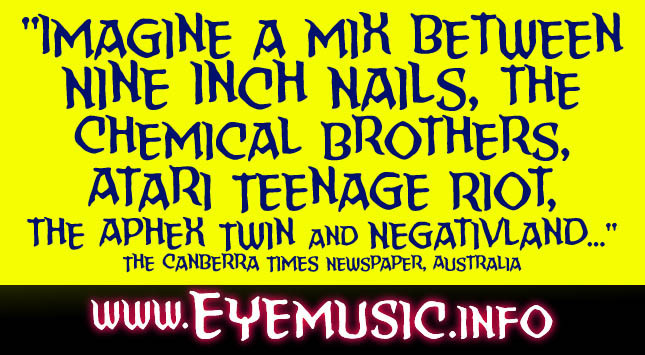 Based entirely on DIY promotion EYE's music achieved very extensive radio play across Australia & internationally. 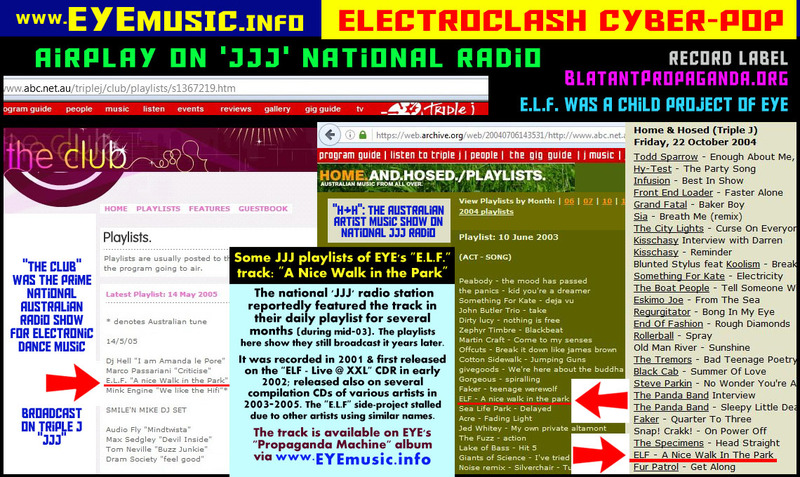 This includes: the popular national radio station JJJ (Triple J) featuring "A Nice Walk in the Park" (electroclash cyber-pop) on their daily playlist for several months as well as on specialty music shows even several years after release - see nearby picture for some playlists. 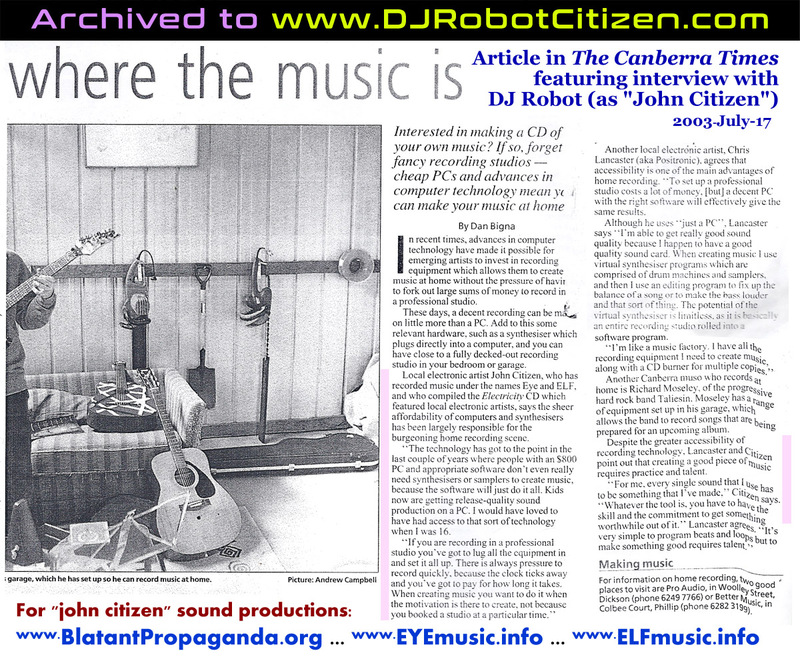 Several of EYE's political protest songs were regularly broadcast on popular community radio stations in Australian big cities - Sydney, Melbourne, Brisbane, Adelaide, Perth & Canberra - some even featured them on high rotation during prime-time shows. 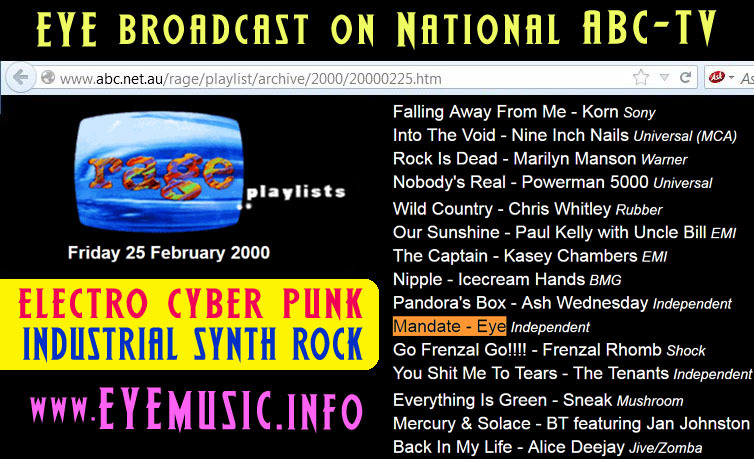 These tracks include: "Mandate!" 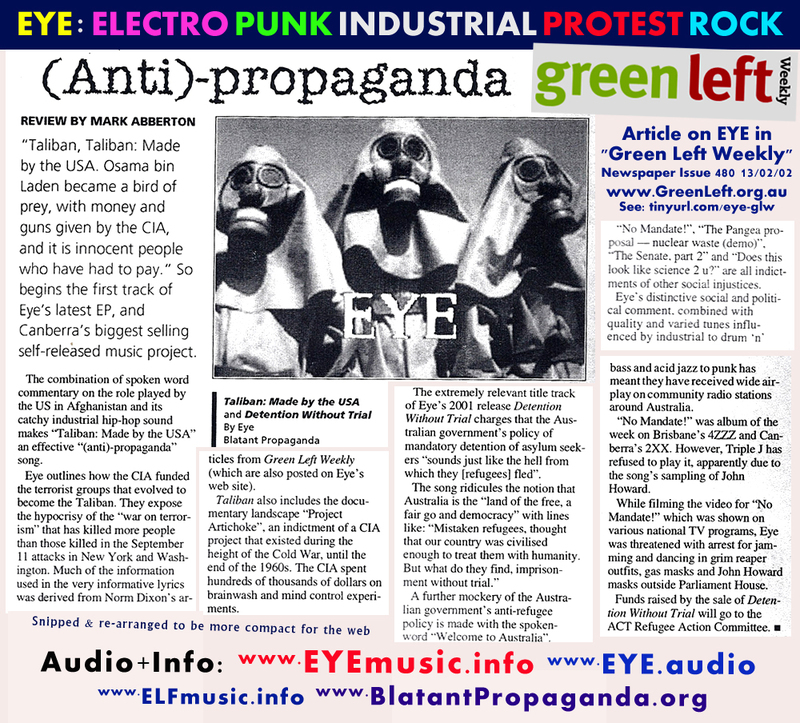 (post-industrial electro rock)... "Refugees: Scapegoats (Detention Without Trial)" (celtic punk rock)... "Workers United (will overcome)" (electro rock)... "Taliban: Made by the USA" (electro industrial hip hop)... "Are You a Terrorist? 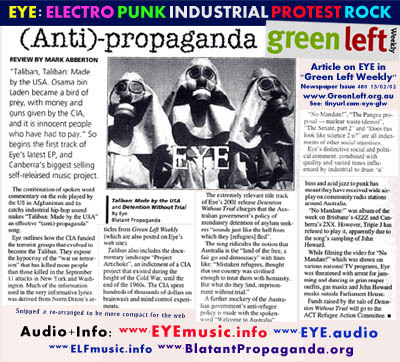 (The government thinks so!)"... 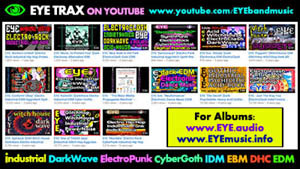 & the early electro industrial cyber punk metal rock track "Grave New World (how freedom dies)"
These projects arose due to the large amount of music being produced. 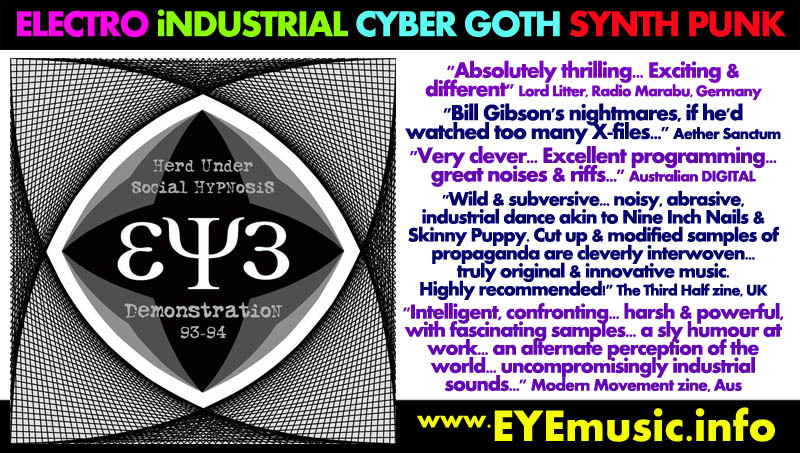 The aim was to target niche audiences: EYE for political electro punky industrial darkwave rock music; ELF for the EDM electronica; AYA for IDM; DJ Citizen for power noise aggrotech cybergoth; QT for techno-house-electro-pop... 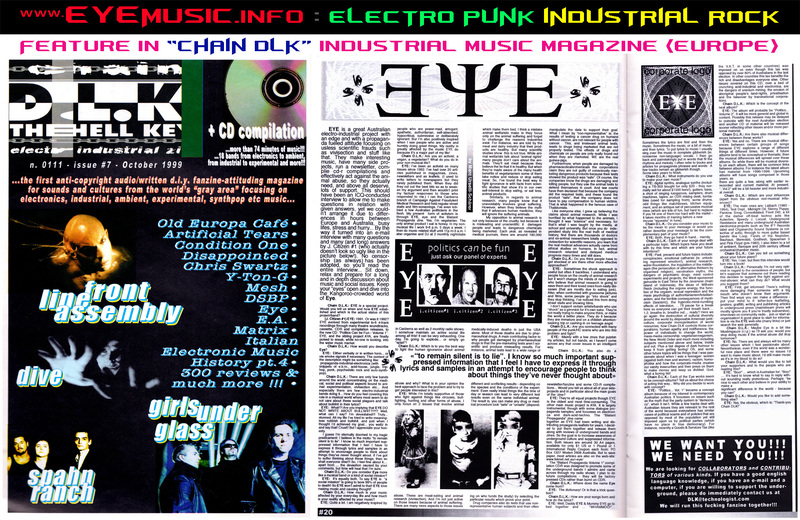 It was later decided that: i) too little time to manage so many projects; ii) (sub-)genres come & go out of favour; iii) diversity under one title makes for a more interesting project. 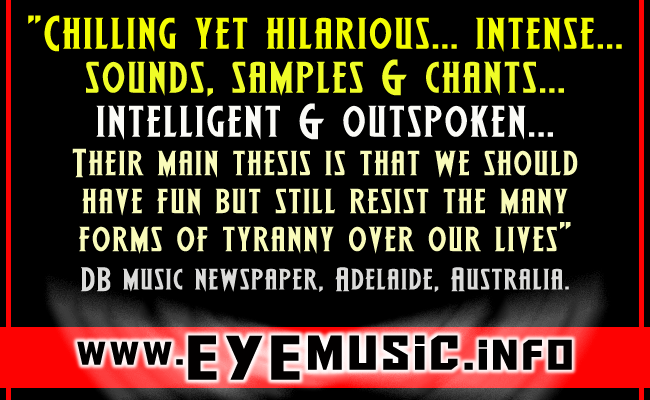 Hence, all material has been re-assimilated; originally it was all EYE music. 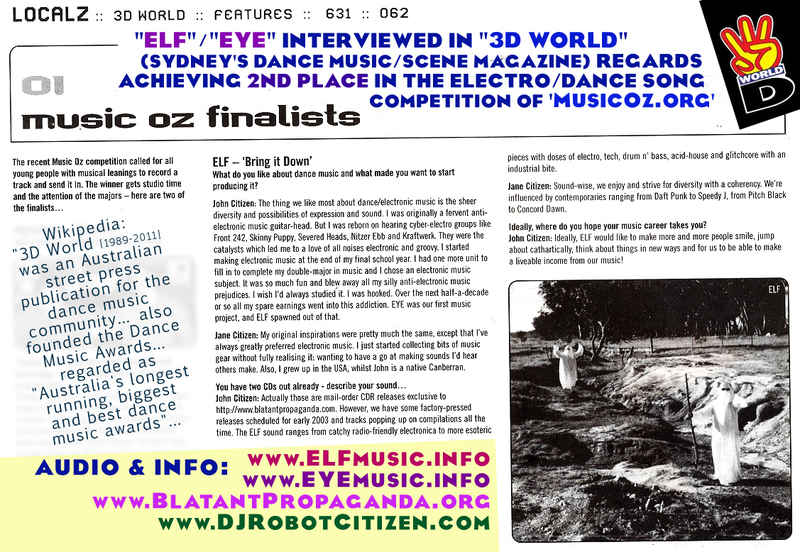 EYE's humanoid components have roots in the cities of Melbourne, Sydney, Canberra, Perth & Newcastle (Australia) as well as the North American cities of Toronto (Canada), San Diego, Los Angeles, Newark, New York & Jersey City (USA); have also resided in Europe - London (England, UK), Berlin, Koln/Cologne (Germany) and St Petersburg (Russia).